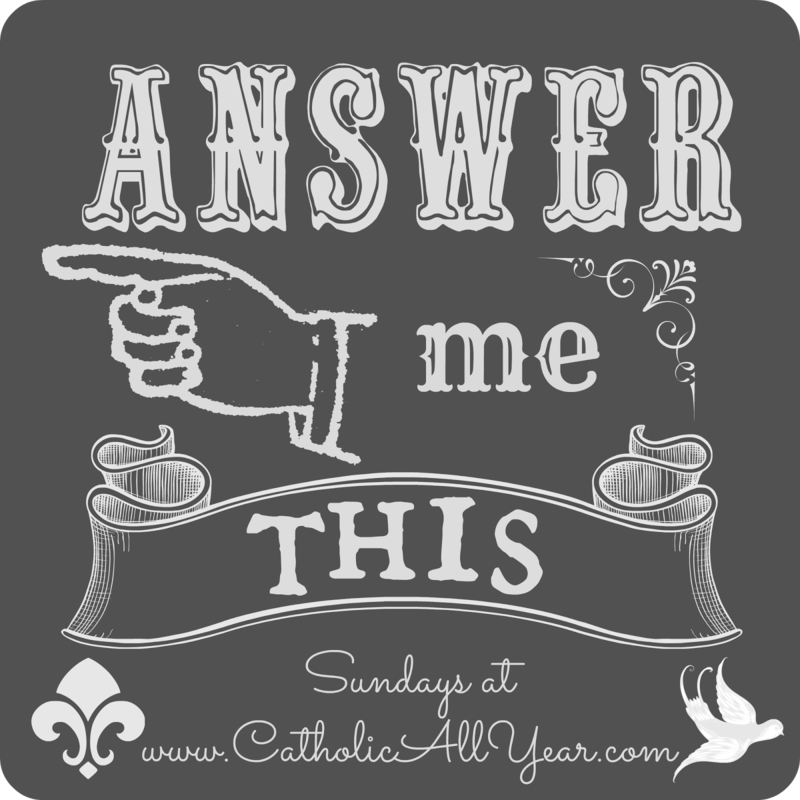 Are you ready for another installment of Answer Me This, hosted by Kendra at Catholic All Year? 1. What’s something you’ve won and how did you win it? Oh, gosh, y’all, I have won so many things. I’m kind of lucky like that it you believe in that sort of thing. When I was a kid they were having a giveaway for a lamp at, I think, the drugstore in our neighborhood shopping center. This was the kind of drugstore you really don’t have any more, that sold a little bit of everything, and had its own charge account system, and delivered medicine, and had a soda fountain in the back, Anyway I remember I wrote my name all different ways and put it in the drawing. I didn’t even put my address but when they drew my name they knew who I was because that was the kind of place this was. Anyway, it was a pretty ugly lamp. I’m not sure where it;s gotten to but it was in the family living room for years. I used to always go barefooted, because I grew up in a house with wall to wall carpet, and we pretty much went barefooted indoors and out as soon as my mother said it was warm enough because this is the South, y’all. My husband is from Baltimore and doesn’t understand this hillbilly habit (his word) and is always fussing at our kids to put on shoes. All of our houses except this one have had hardwood floors, and I got tired of wiping grit off my feet all the time and started wearing shoes or slippers all the time. Now that we have wall to wall carpet, I tend to go barefooted again, unless I have shoes on when I come home that would be a pain to remove. I keep a pair of shoes by the front door for quick trips outside when it’s too cold for bare feet, or if I want to drive somewhere and don’t feel like looking for my shoes. I’ve been in the Rose Garden with Jimmy Carter, and in Gaston Hall with President Clinton, but did not actually get to meet them. I have, however, had my picture taken with Barry Williams (that’s Greg Brady to the rest of you). When I was thirteen my we were at a motel in Chattanooga where for some reason that will be forever unknown to me there was some sort of B-list celebrity conventions. We also got to meet Ron Masak and Trini Lopez (I still don’t know who they are really but my parents said they were famous) and Pat Boone (who was the least friendly). My children, of course. 🙂 I did draw a lot as a child–like all the time, in the margins of my workbooks at school! I loved drawing horses and ladies in old-fashioned dresses. I had a sketchbook in high school where I used to draw (from pictures) sketches of my friends and illustrations for a book I wrote. Those were probably my best technical work. I don’t know why but I lost interest in drawing after high school. That’s a difficult question but I am going to go with touch. I can feel remember the way things feel in my head more strongly than I can remember smells or taste. When I do this it’s almost like I am really feeling them again. Maybe this is no big deal and everyone can do that? That’s it, friends. If you want to read more entries in this linkup, or join in the fun yourself, please go here. How funny about writing your name all those different ways for that store’s drawing! I love that you’ve got a White House story, too!